The last Open Day at the Granary was on 26th Oct 2003. Guitarists came from all over to see and play the guitars. Some of the people who came to the last Open Day were guitarists and teachers. Michael Gee, Steve Rees and Liam Romanillos. 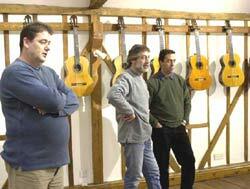 Guitarists from all over the UK attended the Open Day at the Granary and learnt some of the history of the collection. All the guitars in the museum are strung with D’Addario strings of various tensions. They have proved to be long-lived and very consistent. If you'd like to visit the collection, email Granary-Guitars.